At Total Produce, we strive to translate our competitive advantages: our people, our growers, our infrastructure, our relationships – into value for our customers; delivering to them a superior service, and to the consumer, produce which exceeds expectations. We do this secure in the conviction that, through ever evolving operational excellence, we will continue to grow – and deliver to all our stakeholders, equitable, industry-leading returns. Total Produce is today one of the world’s largest and most accomplished fresh produce producers and providers. Local at heart, Global by nature, Total Produce operates out of 39 countries while serving many more. 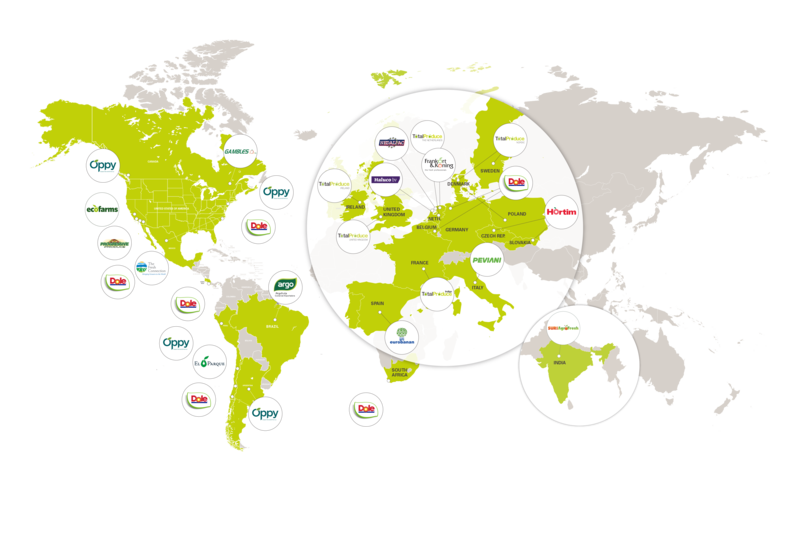 Our industry leading vertically integrated supply chain extends across the globe incorporating over 260 facilities including farms, vessels, manufacturing facilities, cold storage warehousing and packhouses. Growing, sourcing, importing, packaging, marketing and distributing over 300 lines of fresh produce, Total Produce’s range extends from the more familiar to the truly exotic and includes extensive organic and value added fresh cut ranges. Serving the retail, wholesale and foodservice sectors, Total Produce is a complete fresh produce solution provider – offering a comprehensive menu of services to our customers ranging from simple service provision to complete Category Management. Total Produce differs from many of its peers by virtue of its local and global infrastructure and specifically the distribution capacity and the on the ground presence in key growing regions around the world that this delivers. Total Produce’s influence extends from seed to store and farm to fork, extracting costs from the supply chain and adding value to our produce and the service we provide. Investing in innovation. Embracing change. Pursuing the different. The most accomplished growers. The very best farms. The closest of relationships. Best agricultural practices. Exacting standards. On the ground resources. Superior quality produce. Simplifying supply. Meeting demand. Exceeding expectations. Embracing technology. Extracting costs. Delivering efficiencies. Generating value. The reach to deliver. The flexibility to customise. The synergies to compete. Ethical trading. Environmental awareness. Sustainable production. Safe produce. Listening. Innovating. Delivering a competitive advantage.